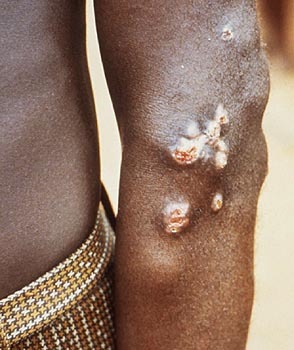 An infectious disease of the tropics caused by the spirochete bacterium Treponema pertenue, usually in unhygienic conditions. The bacterium enters through abrasions, and after about two weeks, during which time there is fever, pain and itching, small tumors appear, each with a yellow crust of dried serum. These may eventually form deep ulcers. The final stages may not appear until several years later and include lesions of skin and bone.